As many of you will be aware, this site is completely against blatant manipulation of online competitions by spurious and repeated voting (other than the ILDSA awards that time, of course). So, we do not in any way encourage Myrtlevillians to log on to the H2Open Facebook page and “Like” and comment favourably on all five of Siobhan Russell’s entries for the June/July edition of the magazine. 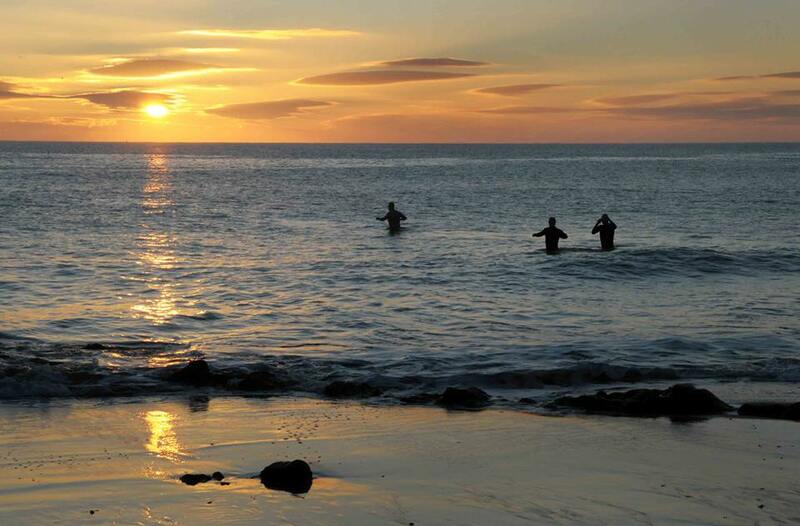 Baywatch in Myrtleville – when Denis’ back was turned, look what he missed! That guy on the left looks like a great swimmer. You can just tell by the stand of him. She got second place in the last competition and a first place would be nice this time. Or even a first, second and third. I’m sure the judging panel would be completely impervious to massive numbers of Likes and Comments but sure, why not do it anyway? This entry was posted in Information and tagged H2Open Magazine competition, Open water swimming - Cork, Open water swimming - Cork - Ireland, Sea swimming - Cork, Sea Swimming - Cork - Ireland by myrtlevilleswimmers. Bookmark the permalink.